Here are seven benefits of calcium that will motivate you to take enough calcium. The major role of calcium is strengthening bones and teeth. People of all ages need calcium to support proper bone development. This mineral is mostly recommended to people with early signs of bone problem like osteoporosis. 1.Strengthening bones – Adequate calcium in the body builds strong bones and optimizes bone mass. Bones have a major role in the body including to provide structure, store calcium, anchor muscles and to protect body organs. Calcium is essential for strengthening the backbone, and reduces the chances of back pain. It helps to keep the bones in their right shape, and prevents bone problems like arthritis and osteoporosis. 2.Ensures healthy teeth and gums – About 99% of calcium in the body is in teeth and bones. This mineral protects our teeth by maintaining strong jaw bone. A strong jaw bone makes sure that the teeth are tightly fitting hence bacteria do not thrive. Thus you need to consume calcium rich foods regularly to prevent your teeth and gums from giving you trouble. 3.Control blood pressure – It has been proven that calcium helps to maintain a normal blood pressure. Dietary Approaches to Stop Hypertension (DASH), a research conducted by National institute of health, revealed the benefits of calcium in that an increased intake resulted in decreased blood pressure. Other studies found that adequate calcium intake together with vitamin D reduced blood pressure in women having mild hypertension. Researchers also found that expectant women who took calcium supplements gave birth to children with very healthy blood pressure levels. Thus such children have lower risks of developing high blood pressure in their later life. 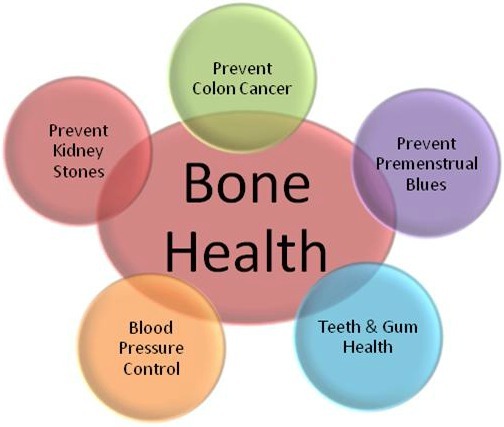 4.Prevent kidney stones – Another calcium benefits is the prevention of kidney stones. Kidney stones occur when deposits of calcium plus other minerals crystallize in the urinary tract. Oxalate stones are among the most common kind of kidney stone. A high calcium diet reduces the danger of kidney stones significantly. It was previously thought that high calcium intake causes kidney stones. Well it is not so. It is excess calcium in water that causes these stones. 5.Protect cardiac muscles – Adequate amounts of calcium promotes normal contraction and relaxation of cardiac muscles. Thus a sufficient amount of calcium in the body is required for normal functioning of your cardiac muscles. This mineral aids the nervous system in maintaining the right pressure in the arteries. A drop in calcium triggers the release of calcitrol which causes contraction of the smooth muscles of the arteries, consequently increasing blood pressure. 6.Prevention of premenstrual blues – The symptoms of premenstrual syndrome are reduced considerably by consuming adequate amounts of calcium. Premenstrual mood swings like depression and irritability are caused by the release of hormones which is triggered by low calcium levels. 7.Colon cancer prevention – The risk of contracting colon cancer is lessened by consuming enough calcium. Adequate calcium intake also discourages the growth of cancer causing polyps. Supplementation helps to reduce the danger of developing nonmalignant tumors in the colon. You should take liquid calcium supplements since they are absorbed five times better than tablets.